Really, it doesn't matter where I'm going. Quena's been my best friend for 12 years, and spending time with her is always the most wonderful part of such a trip. I was in Vermont for four nights, and danced on every single one of them -- three contras and one English. The contra dance scene out there is fantastic, with lots of fun dancers of all ages, and music that just blew me away. I think my favorite night was probably the Brattleboro dance, with music by Ethan Hazzard-Watkins, Anna Patton, and Peter Barnes. I love Anna's clarinet playing especially, and there were lots of good dances that beautifully matched the music (and vice versa). The Saturday Greenfield dance was also excellent, and I really liked Clew Bay's music, their 10-year-old drummer, and the surprise extra lindy hop at the end. On the gray and rainy Saturday morning, Quena and I went to the Scott Farm apple orchard, which was delightful. We spoke with a guy who looked like some craggy old wild man of the mountains, but who turned out to be extremely sweet and as enthusiastic about his apples as a wine connoisseur. He sold us a bunch of Calville Blanc d'Hiver apples for our pies, which "sparkle, like champagne." We also got an assortment of other varieties for applesauce, including Cox's Orange Pippin, Red Spy, Empire, and others I don't remember. These apples inspired a great deal of our cooking, baking, and eating for the rest of the trip. We made a full size apple pie, and 10 mini pies in muffin tins (which we took to the Saturday dance to share with friends and with the band). We also made 5 jars of applesauce (some with ginger), and apple-onion crepes. And there were still enough for me to bring a bag home. Yum! On Sunday the sun came back and we went hiking around Kilburn Pond in the Pisgah State Park (in New Hampshire). We had to wear special "don't shoot me I'm not a deer" colors, since it's hunting season, but we had no encounters with either the hunters or the hunted. The woods are gorgeous, and I loved my first taste of the fabled New England fall colors. My favorites, though, are the evergreens that still pop up to accent all the bright oranges, yellows, and reds. One afternoon, Quena and I were in the co-op buying more supplies to help us bake all our apples, and she pointed out that Keith Murphy (of Nightingale) had just walked into the store. I'm a big fan of him and the band, so I allowed myself a moment of fan-boy excitement before deciding not to bug him, and just let him buy his groceries in peace. Shortly after that, we ran into a friend of Quena's, made some introductions and small talk, then continued shopping. But then I heard behind us that the friend had also found Keith and started talking to him. She was saying something along the lines of "you probably don't remember me, but you stayed at my parents' house in New Mexico several years ago when you were on tour..." etc. So at that point I just had to go over and join in. "I hate to interrupt," I said, "but I couldn't help overhearing, and I wanted to mention that you also stayed at my parents' house about 12 years ago when you were playing some dances in Santa Cruz..." (it's true). He took it all very good humoredly, turning next to Quena, extending his hand, and asking "and when did I stay at your house?" I found it all highly amusing. I'll wrap it up with one other funny story from one of my plane flights. Lots of the Delta employees were wearing pink shirts for Breast Cancer Awareness Month. One of the stewardesses also made an announcement to say that they'd be selling pink lemonade to raise money "for breast research." There was general laughter until one of the co-stewardesses nudged her to correct herself and clarify that it's breast cancer research. Anyway, it was a wonderful trip all around, and you can see a few pictures here. And now I'm home. Well, it's time for the next and last update on my living room wall art project. (See previous posts: 1, 2, 3, 4.) This was never the sort of project that would have an actual end point, but given that I'll be moving in a couple weeks, it seems time to declare it "finished." I'll be taking all the little squares down soon and packing them up to take with me, but I very much doubt I'll have a similar wall space in which to recreate the overall mosaic. Though I wouldn't necessarily want to, really. This is something that's just sort of grown up here at The Live Light Ward, and it would seem out of place if it were transplanted elsewhere. I could conceivably start a new overall design using the same pieces, of course. But I think I'll more likely just retire it all and see what new project the new apartment suggests to me, once I've moved in. I'll miss this guy, though. I just signed the papers yesterday to move into an apartment at the Ananda community in Mountain View. I'll be doing the actual move in late September, and I'm greatly looking forward to it. I'd been vaguely wanting to move to the community for a while now, especially after spending two weeks at Ananda Village, the original Ananda community, for the Living with Spirit retreat. But I hadn't let myself get too attached to the idea, since I didn't think I could justify raising my rent as much as I thought I had to. Then last week I found out that there's a "junior one-bedroom" apartment there with almost exactly the same rent as I'm paying now. So I just tossed the excuses out the window and went for it. Since the apartment is a "junior," I'll have about 1/3 less space than I do now. But I don't really need all the space I currently have, and there's a bunch of stuff I've been wanting to get rid of, rearrange, and/or simplify anyway. So I think it'll be a fun challenge to find a way to fit well in there. And it's a nice little apartment, in spite of being small. It has a lovely fenced-in patio, with space for all my potted plants, and even some actual dirt to plant things in. (And of course there's the community garden I can play with, too.) It's probably one of the sunniest apartments in a complex with lots of big, shady trees, so that's sort of the best of both worlds in that department. And I think it's literally the closest apartment to the meditation temple, which is just a very nice place to be. One thing I was appreciating during this latest season of So You Think You Can Dance was the solos. It seemed to me that more people were actually putting some thought into choreographing their solos to the music, and we had less of the "just turn on some song and do your stuff" kind of thing. I find that hugely important, since to me dance is inextricable from music. If you really want to have the biggest impact, you've got to get the most out of each part of the equation. Brandon, however, deserves special props for taking this to still another level during the penultimate week of the show. He went beyond simply choreographing with the music, and also optimized both his choice and editing of the music. I didn't know the piece he used, but it was orchestral, choral, and hugely dramatic. Not only that, but he used the ending of it, with a powerful, bravissimo!-sort of ending that practically commands you to stand up and applaud your hands off. Combine that all with the fact that Brandon is a fantastic dancer, and it's no surprise that he got a standing ovation from the judges. In fact, I think it's incredible that I've seen 4 seasons of this show now and this is the first solo like this that I remember. You'd think it would be a no-brainer, but so many dancers just let their music get cut off wherever the 30-second break comes. So even if it was a beautiful solo, you're left with a sense of frustration at the interruption, rather than a sense of satisfaction from the completion of an excellent performance. As for the actual results, I thought Brandon had it in the bag after that solo. But Jeanine was tied with him in my own preferences, so I was quite please with her winning in the end. (And she had a wonderful tango-esque solo the last week.) I was surprised at Evan making it into the top 4. As much as I love him, Ade was honestly the better dancer. But oh well, it was still good to see the "nice guy" get that far. And as for the choreographies, I thought the final competition show was kind of weak for a finale, aside from the Paso Doble, which was probably the best one of those they've had on the show yet. Throughout the season, though, there were some really good routines, so the final results show with the judges' favorites was excellent. I thought the hip hop routine that started the whole season was excellent, and I was also very impressed with the "Addiction" contemporary piece, and Brandon and Jeanette's tango. Lots of good stuff. 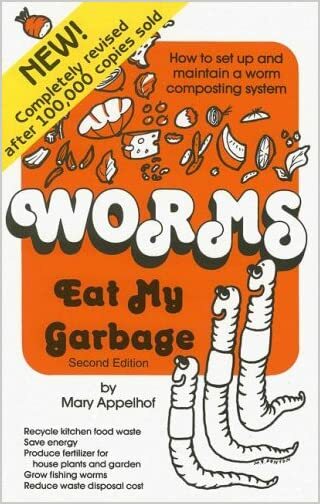 A little while ago I read Worms Eat My Garbage, by Mary Appelhof, which got me inordinately interested in worms. It's hard to have a regular compost pile if you live in an apartment, but a worm bin solves that problem perfectly. It's compact, neat, doesn't smell, you can keep it inside if you need to, and the worms do most of the work for you. They'll even regulate their population based on how much space and food you give them. So on Saturday I picked up a "Wriggly Wranch" worm bin at a discounted price from the San Jose Environmental Services. They sell these and other composting systems periodically, and also give composting workshops (see the schedule). You might have to be a resident of Santa Clara county for all that, but other places offer similar things (e.g. San Mateo county). The Worm Dude was also there selling worms, so I got them at the same time. And so now I've got about a thousand worms (1 lb.) all munching away at the compostable portions of my garbage, making nice fertilizer for my plants, and keeping more stuff out of the dumpsters and landfills. Yay for worms! I'm leaving today for the "Living with Spirit" retreat up at Ananda Village. So for the next two weeks I'll be camping, meditating, doing yoga, taking classes, experiencing life in a spiritual community, and doing other fun things. Oh, and hoping I don't miss my first tomatoes, though Cathy will be looking after them for me. See y'all mid-July! I just finished listening to Shantaram, by Gregory David Roberts, narrated by Humphery Bower, and I have to say I spent every one of those 43 hours completely enthralled with his voice. First of all, he's Australian (appropriate for the first-person protagonist of the book) so everything is delightfully accented, even just the "base" narration. But it's the character voices that always really sell me on a good narrator. Most of the book takes place in Bombay, so there are umpteen different Indian characters, all with distinguishable, recognizable voices. Aside from that, though, there are numerous characters from other countries, with accents as diverse as French, German, Spanish, British (London and Liverpool versions), Canadian, American, Iranian, Pakistani, and Afghan. And as if juggling all that weren't enough, he also handles cases like British-educated Afghan, New York Pakistani, and an Australian faking an American accent while speaking Hindi. The guy is a genius. And even beyond the accents, the overall narration is just exquisitely done. Every little shading and coloring of emotion and meaning is conveyed perfectly in the intonation. Not too much -- I've heard narrators that overdo it -- but just right. This goes both for matching explicit descriptions in the text and for applying his own interpretations to the rest of it. There have been a number of times when I could tell that I would have read something in a very different way in my head, but that Bower's version worked much better. You get to build trellises for them (or, in my case, tie crazy arrangements of string and sticks to balcony railings). I mean, really, what more could you want? I got to do several fun things this weekend, starting back on Friday with dinner and birthday stuff with Mom, Lacey, and Cathy, before going out waltzing. Then a Waldon gathering on Saturday (more of a general family reunion, but family + apple cobbler + double chocolate brownies is close enough to a birthday celebration for me). Then yesterday Cheryl and I made one of my weirder ice creams (about which, more here) and other amusing sillinesses. So today, the actual day, will probably be a bit different. But I always like to make sure I get some quiet, introspective time around my birthdays, to think and write and such. And to plant a lot of new seedlings in my garden. And to work my way through the leftovers of five different, excellent desserts from this weekend. That'll make for a good day. As with many good things of this sort, this was inspired by my sister. Turns out it's actually quite easy to make vanilla extract. Get a bottle of vodka. Slit the beans, stick them in the bottle, shake it up. Put it in a cupboard for a few months. As you use it up, you can top it off with more vodka, and if you need a vanilla bean for something, you can pull one out and replace it with a fresh one. So it can be a fun sort of ongoing thing. Yum! Nightingale has a beautiful song on their third album called "Hills," which I only started really hearing properly a couple weeks ago. We can pray for strength, but what is strength without a use for it? Both sides of the equation have to go together. Sounds like an opportunity. Let me ask you something. If someone prays for patience, do you think God gives them patience? Or does he give them the opportunity to be patient? If they pray for courage, does God give them courage, or does he give them opportunities to be courageous? If someone prayed for their family to be closer, you think God zaps them with warm, fuzzy feelings? Or does he give them opportunities to love each other? It's a good reminder. If we're going through difficult times, we're not just suffering -- we're learning to be patient, or brave, or loving, or whatever our own personal lessons need to be. It's an opportunity to consciously acknowledge and accept those lessons. Sometimes it may be hard even just to tell what's going on, but we can still keep climbing our hills, and trust in the strength that goes with it. Bob, Lacey, and I have been organizing a new dance event. 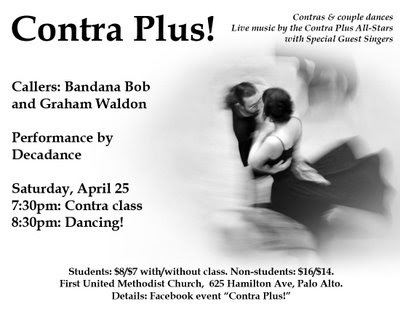 It's called Contra Plus!, and will be about half contra dances and half couple dances -- waltz, swing, polka, tango, etc. The music will be awesome, Decadance will be performing for us, and Bob and I will be calling. If you haven't done contra before, just come to the class beforehand and we'll get you up to speed right away. If you're primarily a contra dancer, it'll be a fun chance to do more couple dances. Full event details are on Facebook -- feel free to pass it around and invite all your friends! A little over a year ago I was beginning my first Vipassana meditation retreat on the evening of a full moon. On today's full moon, I'm going to start level 1 of Ananda's meditation class series. I like the symmetry of that. When I was learning Vipassana at my first meditation retreat -- almost a year ago now -- I had one main concern about it. It seemed to me that if you really did manage to let go of desires and aversions, then you would end up never doing anything ever again. How would you make choices? Why would you bother taking any actions? I forget precisely what the teacher told me when I asked about it, and I don't think I fully got it at the time, though I decided it was enough to be getting on with, at least. The idea is that detachment actually allows you to make completely free choices, unencumbered by fears, worries, selfish desires, etc. That leaves you open to base your decisions and actions solely on whatever knowledge, wisdom, and love you may have. Which is generally better than what we usually do. I recently read a couple of excellent books by Deepak Chopra that illustrate this really well. The first is Buddha: A Story of Enlightenment. I was surprised to find a portion of the story that took place between Gautama losing his sense of self and his becoming fully enlightened. A peasant girl has found him emaciated and nearly dead, and is nursing him back to health. He's aware of everything around him, but is so detached that there's just nothing there -- no great spiritual leader, no nothing. I found it somewhat alarming but also fascinating at the same time, because that was exactly the fear that came to me last March. So what is left to do at this point? The final change occurs when he stops identifying with nothing, and begins to identify with everything. That is what makes a Buddha. But there's still the question of choice. If anything, the Buddha has far more choices after enlightenment, with knowledge and options far beyond what most of us realize. He could even choose to simply remain sitting under the bodhi tree and enjoy his oneness with everything forever. But in his omniscience he also realizes that there are countless other souls out there, still imagining themselves to be separate, alone, and suffering. And the same spiritual passion that drove him for years to find his own enlightenment now guides him to do the same for his newly expanded, universal "self." So he again picks up the body that "he" started in, because all the individuated souls will need that in order to understand how to relate to him, and he uses that to go forth and teach. 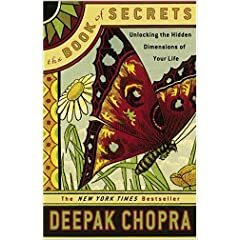 The other of Chopra's books I wanted to mention was The Book of Secrets: Unlocking the Hidden Dimensions of Your Life. This is an incredible but very challenging book, because I think it takes you as far towards complete universal oneness as you can get through mere words and intellect. But even if we don't get so far as believing/understanding that we are the universe, hopefully we can all agree that we're at least a part of the universe, simply by virtue of being in it. So our choices and actions at any level really are affecting, changing, and therefore creating the universe. We can't help it. Thinking about things that way gives us an interesting new framework of significance or even responsibility in which to evaluate what we do. How might we make different choices if we view them in terms of creating the universe we live in?